For your meeting request, less is more. There’s an interesting trend occurring within hotel sales and meeting planner offices across the country. It’s one that, quite honestly, defies logic. Hotel group sales offices are receiving more meeting leads than ever before. They should be happy about this, right? Wrong. Because they’re actually closing far fewer of those leads than at any time in history. And for you, the planner, it means incomplete and late bids, if you receive any bids at all. So what’s up? 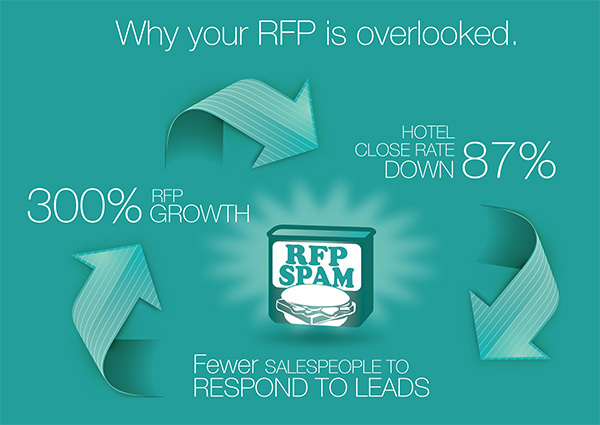 What is RFP spam? Simply, it’s an RFP (meeting request) that is sent to a large number of hotels at the same time – hence the term spam, because there’s only one hotel that can book that meeting while dozens are asked to respond. Some planners we've talked to tell us that they’ll send their one meeting request to 90 or more hotels at the same time. Why is this happening? 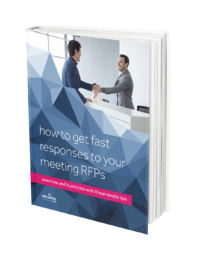 It comes down to technology and the automation of one very important step in the booking process: the distribution of the meeting RFPs. Often, in one click, you can capture an entire city's worth of hotels and easily send one meeting to 30 or 40 hotels at time. Why is this bad? It comes down to two issues: the sales managers’ time and their own confidence that they actually have a shot at booking the meeting. Let’s take a look at their day. Ding! The lead bell goes off and there’s a meeting lead in their inbox. Total hotel sales hours invested to respond to this lead: 20 hours (remember, it’s 20 sales managers x 60 minutes). Said a different way, this lead has a 5% chance of closing. Because now it’s all about the sales manager’s time. Will the sales managers work harder on the lead with 20-30 hotels on it, or the one that has 5 or 6 hotels? Which one would you give your time to? Right, the one that has fewer hotels and hence, a far greater chance of booking. This is the key point. So what can you do to break through the log jam at the sales office? Plenty. Boiled pork product tip #1: Tell the hotel how many hotels they’re competing with and who they are. Nothing gets a sales person going more than a little competition. Knowing the landscape will benefit you as hotels will likely fight harder for your business. Boiled pork product tip #2: Keep the hotel list down to 8 or less (4 or 5 and you’ll be surprised at the responses). Again, reducing the competition for your hotel partner means your meeting request will garner more of your sales manager’s time and attention. Follow these two tips and you’ll be well on your way to receiving the best your hotel partners have to offer. You’ll also be playing a big role in helping to solve the biggest issue facing hotel sales teams today: their own productivity. That will benefit you in more ways than you may imagine.